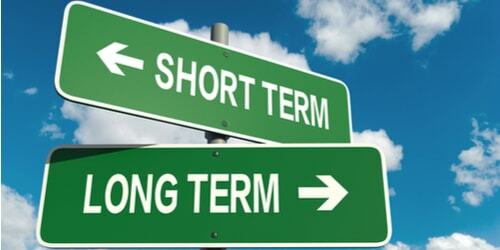 What are the Advantages and Disadvantages of Short Term Investments? Short term investments are often popular with investors when they aren’t happy with current market valuations and pending interest rate movements. So it’s good news for those looking to leverage this investment channel as they have plenty of options. Unlike long-term investments, short term investments come with the added advantage of high liquidity. For example, your bank’s savings account will offer the highest liquidity as you can withdraw your money at a moment’s notice. Somewhat similarly, treasury bills can also be traded at their fair market value, but this will be limited to the hours of market operation. Money markets and bond mutual funds are far less liquid where it might take a couple of businesses days to settle. At the same time, short term investments like savings accounts come with low volatility as they are insured by the federal government (up to a certain limit). But at the same time, the investment will be vulnerable to purchasing power risk. Unlike long-term investments where your risk is significantly reduced, in the short term investments can make your exposure to risk, significantly higher. This can also be attributed to the lack of time to adequately correct mistakes. You also pay fewer taxes on long-term investments, the same can’t be said for short-term capital gains which are taxed differently. Furthermore, you also risk incurring more expenses with short term investments. For example, you can be charged higher brokerage fees and commissions. What’s more, if you’re a speculator, you will also have to pay more transaction fees. If you’re dealing with short-term securities like bonds, inflation can also have an impact on your return. Another disadvantage is the fact that investments tend to grow steadily in the long-term. The same can’t be said for investments made in the short-term. Long-term investments also come with the added advantage of making better predictions by observing the financial market in the long-term. The same can’t be said if you intend on getting in and out quickly. But for the seasoned investor, both short-term and long-term investments can be highly beneficial based on individual goals and circumstances.